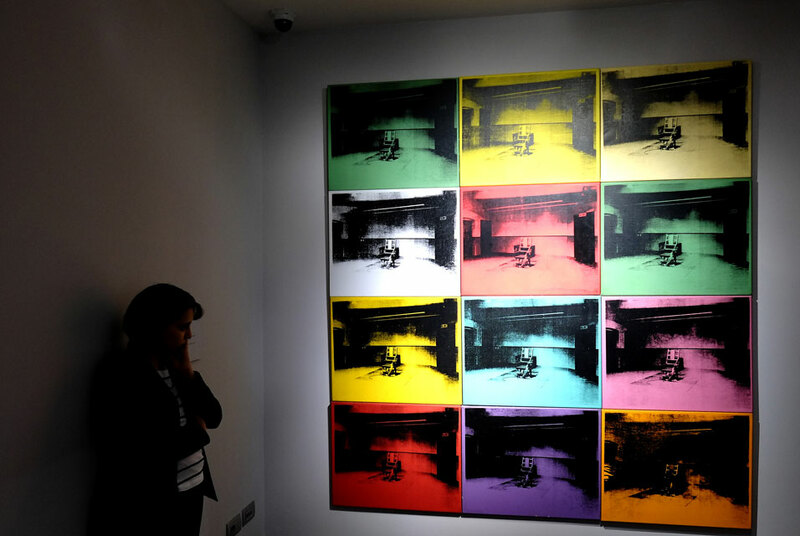 A woman stands in front of “Electric Chairs” paintings by US artist Andy Warhol as part of the exhibition “Warhol” on April 17, 2014 in Rome. The works of the artist, father of American Pop Art, will be housed in the renovated rooms of the Museo della Fondazione Roma, Palazzo Cipolla from April 18 until September 28, 2014. The exhibition features over 150 works, paintings, photographs and sculptures from the collection of Warhol’s friend Peter Brant. The works on display range from Warhol’s early drawings right up to his Last Supper series, first presented in Milan in 1987 in what was to be his last exhibition before his death that same year. AFP PHOTO / ALBERTO PIZZOLI. ROME.- The first major monographic exhibition devoted to Andy Warhol, the father of Pop Art, has arrived to Rome after its highly successful period at the Palazzo Reale in Milan, where it attracted more than 225,000 visitors and was highly acclaimed by the critics. From 18 April to 28 September 2014, one hundred and fifty Works by the American artist are on display at the Museo Fondazione Roma, Palazzo Cipolla. These works have been loaned by The Brant Foundation, whose founder and President Peter Brant–a personal friend of Warhol and a well-known collector – is also the curator of the exhibition, with contributions from Francesco Bonami. View our Stunning Warhol Collection here.